Today Donald Flaherty makes an appearance on CSReview, talking about his passion for films and his recent work. CS: Welcome to CSReview, Donald. You are an accomplished director and writer. What was the prelude to your choosing to work in the film industry? Donald Flaherty: I’ve been a film fan since childhood, “Jaws”, “Star Wars”, “Superman the Movie”, were huge influences on my life as a kid. As I got older, I also became a big fan of John Hughes and his films “The Breakfast Club” and “Trains Planes and Automobiles.” My parents always encouraged my artistic ambitions. Music, dance, theatre, film and creative writing have always been part of my life. I have been very blessed to have that support from my family. CS: Let’s talk about one of your recent projects, The Steamroom. How did the idea for this comedy come about? What’s the story behind the title? Donald Flaherty: The original seed for The Steamroom came from a gym where I used to workout. I noticed this group of guys that were always there talking away. They never really seemed to be exercising. The gym was like their clubhouse to hangout at. 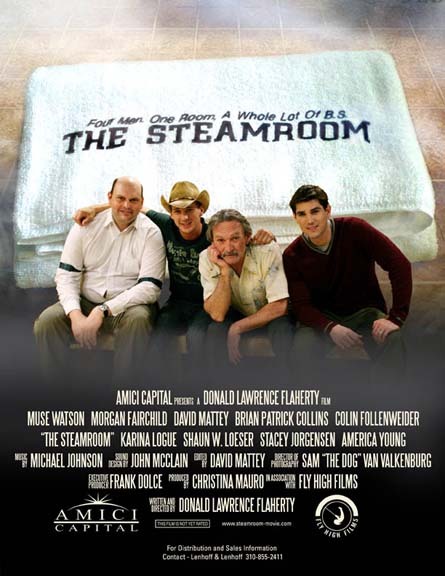 The gym and its’ steamroom just seemed like a really great place to set a comedy about a bunch of men. CS: Drawing from the real life should provide sufficient material to build on in a film. Still, four guys trying not to ruin their lives, going about their own business, entertaining fantasies of their own… Why should we care? Donald Flaherty: The Steamroom is a character driven comedy. I always say it’s like The Hangover meets The Breakfast Club. And like those films, it’s a comedy/drama with relatable characters that everyone can see a little bit of themselves in. CS: Sounds very reflective. I can appreciate that. Speaking of characters, who’s your favorite in The Steamroom? Why? Donald Flaherty: That’s like asking a parent to choose their favorite child. It’s kind of impossible to do. LOL. I love all of them for both their strengths and weaknesses. CS: I knew you’d say that! All right, well, filming a comedy is always a very serious business – any jokes from the set you could share with us? Donald Flaherty: This was a very special film to shoot because everyone involved became a good friend during the process. Everyone was working overtime to make the experience fun. It was like the best summer camp ever. Colin Follenweider who plays Chris in the film was always busting everyone up with some craziness. The guy is fearless and is willing to push the limits of any comedy moment. Dave Mattey who plays George in the film is a genius. Really he is, he’s got the MENSA card to prove it. So, having him around just elevated the comedy to a whole other level. Brian Collins, who plays Sidney, is the quiet one. He stands off to the side and out of the blue will drop these amazing insightful comic moments that make you laugh so hard you cry. Add a veteran actor like Muse Watson and actress Morgan Fairchild with her wicked smart sense of humor, and it makes an amazing set to be on. CS: What was the most memorable experience shooting The Steamroom? Any production challenges, anything the cast and the crew had to overcome to complete the movie? Donald Flaherty: The Steamroom was shot on a shoestring budget. It was less than the catering budget for a day on a Michael Bay film. The lack of money made for some interesting challenges, but it ultimately made for a better film because we had to constantly be creative. The cast, crew and producers did an amazing job of pulling rabbits out of hats to make things work. The most memorable moment for me was when we did the first table read of the script with the full cast. Getting to hear the script I wrote come to life with this group of actors was amazing. CS: No doubt that’s because your cast and crew ensemble was such a successful match. Describe working with the team of The Steamroom in one word. CS: Where are you today, professionally, and where would you like to be in five years? Donald Flaherty: Today I’m gearing up to shoot my next film. My team is going through the process of raising money and pulling all the elements together to pull it off. It’s an exciting time filled with lots of ups and down. But that’s just part of the journey. Oh, and if anyone wants to invest in a new film – feel free to hit me up :) In five years I hope to have at least five more feature films under my belt and be working with a larger budget on each subsequent film. I’d also love to be working with many of the same people from The Steamroom. Keeping the team together would be awesome… Thanks for the great interview and if any of your readers want to check out the The Steamroom they can download it on iTunes or at Flixfling.com. CS: You are welcome, Donald. Thank you for sharing the story with us. Much luck to you with future projects!